The government of Hamburg, Germany, has announced it will ban all cars from driving in the city center by 2034 in a bid to significantly reduce greenhouse emissions. The second-largest city in Germany is in the early stages of implementing an ambitious development plan called Grüne Netz (Green Network). It aims to replace several major roads with green spaces that will give residents a chance to engage in outdoors activities such as hiking, swimming and having a picnic right in the middle of the city. The green spaces will all be connected and they will stretch from downtown to the outskirts of the city, covering roughly 17,000 acres and 40-percent of Hamburg's total area. With cars banned, residents will move around by riding a bike, taking various forms of eco-friendly public transportation or simply walking. The plan is controversial, but politicians suggest that a majority of residents support the project. "Our residents are quite progressive. Many Hamburgers are willing to give up their cars, which is very unusual in Germany," said Jens Kerstan, the leader of the city's Green Party. 30 planners are working around the clock to turn the plan into a reality. Officials hope the Green Network will significantly reduce the effects of global warming. The city is located right on the North Sea and it has witnessed the sea level rise by nearly eight inches over the past sixty years, making it a high-risk area for flooding. 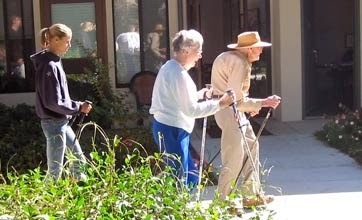 Will you still love your "walkable city" when you are frail?